Posted November 24th, 2018 - News Posted for China News, World Surfing News. To view schedule and heats for November 25, click here. The Elite of SUP Surfing shined with high scoring rides on the second day of competition at the 2018 ISA World SUP and Paddleboard Championship in Wanning, China. The world’s best took advantage of the long walls at Riyue Bay’s left pointbreak to notch scores in the excellent range. 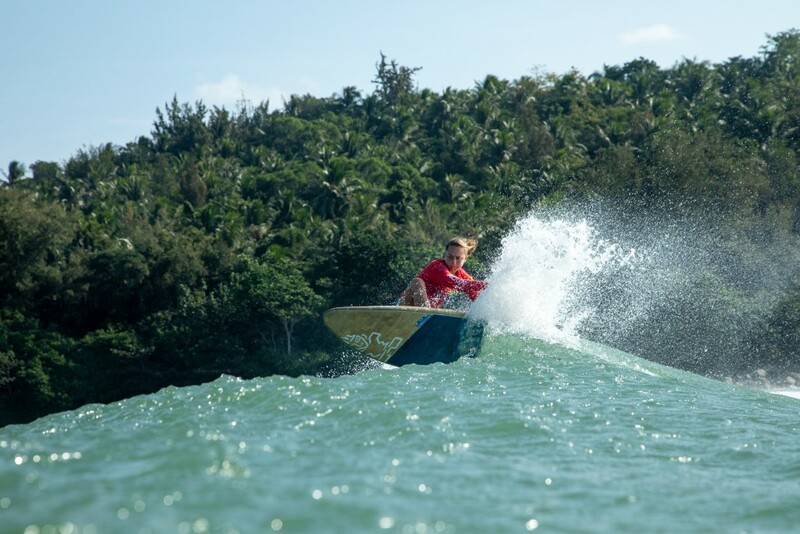 Australia’s Harry Maskell nearly reached perfection with the highest wave score of the event, earning a 9.5 out of 10 in the Round 2 of the Men’s Main Event. The defending Women’s World Champion Shakira Westdorp (AUS) continued to impress with the highest score of the day among the women with 12.67. However, Westdorp placed third in her second heat of the day, falling into the Repechage where she will have to take the long path if she is to repeat as World Champion. France’s Caroline Angibaud, an ISA Silver Medalist, closely followed with the second highest women’s score with 12.43. USA’s two-time Gold Medalist Sean Poynter earned the highest heat total for the second consecutive day with 17.10. The first Repechage Rounds ran in the afternoon, eliminating the first competitors from the event. With the Repechage format, surfers that lose in the Main Event have a second chance to advance in the Repechage Rounds. However, the road to the Grand Final via the Repechage is much longer than the path through the Main Event. USA’s three-time ISA Gold Medalist Candice Appleby advanced through the first two rounds of the Women Main Event on Saturday. “It’s really great to see the ISA going with gender equality as far as participation goes,” said Appleby. “There are so many amazing racers and surfers in our sport, and the level just continues to increase. “I am really impressed with China and the waves that are on offer here. I had almost no preconceived notions before coming here, but I am really pleased with the warm water, climate and waves. Team Brazil has fielded a strong contingent of SUP Surfers in the event, featuring two past ISA World Champions, Nicole Pacelli and Luiz Diniz. Teammate Caio Vaz, considered one of the elite athletes of the sport, is looking to win his first ISA Gold and surfed strong into Round 3 of the Men’s Main Event. “I am coming off a serious injury, so at first my goal was just to come here and enjoy the event,” said Vaz. “Now that I am winning heats, I am getting the hang of it and I want to win Gold. “I am a two-time Champion in the APP World Tour, but I want to win at the ISA. It’s exciting. “It was another day of amazing waves at Riyue Bay,” said ISA President Fernando Aguerre. “What more could we ask for? “SUP Surfing has been getting the event off to exciting start, and the sprint, distance, relay and technical racing events coming up later in the week will build upon this momentum. “Athletes hailing from 26 nations on all 5 continents of the globe have been displaying their team camaraderie and pride, exemplifying how SUP has spread to all corners of the world under ISA leadership.